In 1990 my four youngest children began homeschooling. They went from Ayanna in 8th grade to 2 year old Cabral. 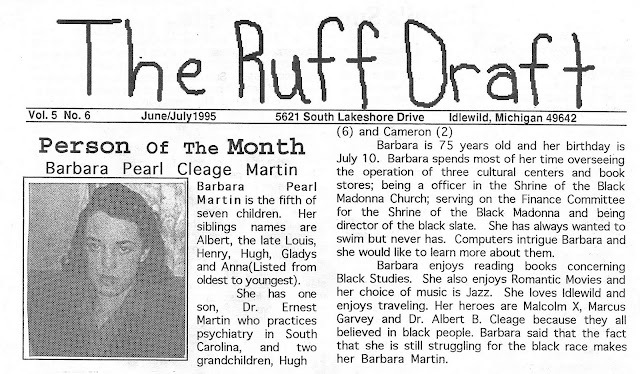 Soon after we began to publish a family newsletter, The Ruff Draft. They did the writing and I did the layout. They would send out questionnaires to family members and write a Person of the Month article from the information they got back. Last night I was going through my Ruff Draft archives and thought I should publish some of the articles on my blog. Since today is my aunt’s birthday, it seems like the perfect time to run this. Last year we went to South Carolina and helped her celebrate. This year she said she’s keeping a low profile. See more photos and information about my aunt at Barbara’s 90th Birthday. Witherspoon Presbyterian Church 1909, Indianapolis, Indiana. 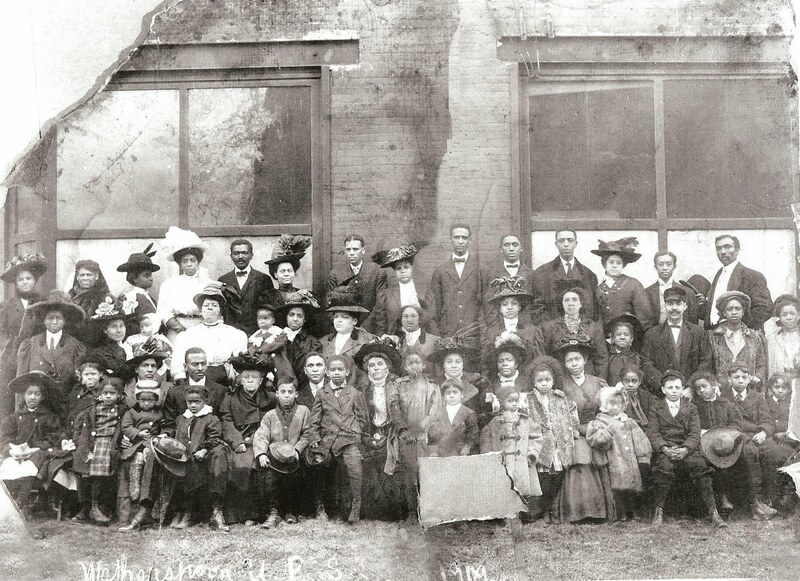 This is a photograph of the congregation of Witherspoon United Presbyterian Church in Indianapolis, IN in 1909, two years after they organized. This photograph is from the personal collection of my cousin Vivian Vaughn McDonald. 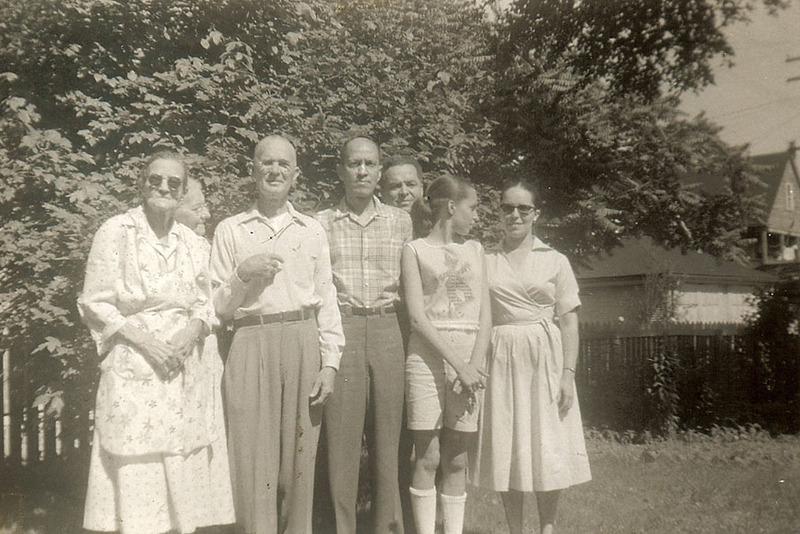 My grandmother Pearl Reed Cleage is the third person on the top right. 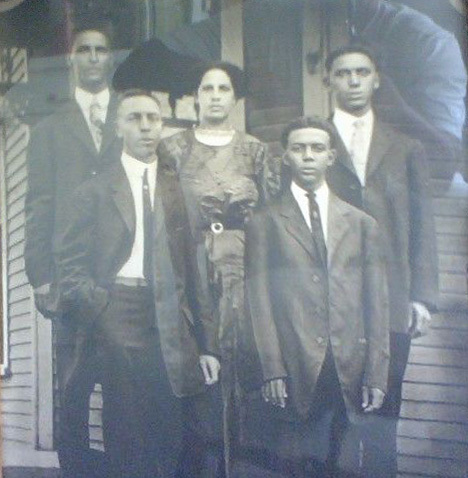 My grandfather, Albert Cleage is next to her. They wouldn’t be married for two more years. Next to Albert is his brother Jacob and next to him is their brother Henry. Directly in front of my grandfather Albert is Jacob’s wife, Gertrude. Three people over from Henry is James Cleage, their sister Josephine’s husband. He was from a different Cleage branch. In the second row, second from the right is Henrietta Cleage, oldest daughter of James and Josephine. 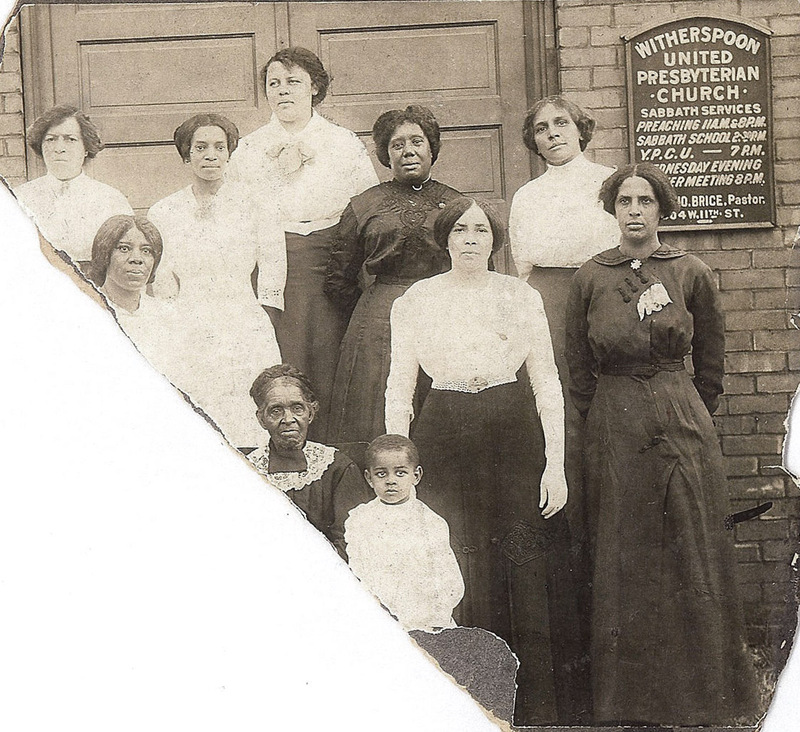 Although the woman 4th from the left, front row, looks like Josephine to me, I’m told Josephine was not there for the photo but was home pregnant with Hattie Ruth, the youngest of her five children. In the 1909 Indianapolis City Directory Witherspoon United Presbyterian Church is listed as located in Realty Hall with Rev. David White as Pastor. Here is another photograph in front of the church. Also from my cousin Vivian’s collection. Josephine Cleage is on the far right, wearing a dark dress. The history below if from the Witherspoon web page, however they seem to have taken the history section down. On April 30, 1907 the Presbytery of Indiana of the United Presbyterian Church held a called meeting at Realty Hall in response to a petition signed by 31 persons asking to be organized into a United Presbyterian congregation. Prof. David Graham of Rushville was moderator and Rev. W. W. McCall of Greensburg was secretary. Other members present were Rev. Fred W. Schmuch of Milroy, Rev. N. B. McClung of Vevay, Rev. Mr. McDill of Madison, and Dr. Cowan of Indianapolis. The petition was discussed at some length. By unanimous vote an organization was decided upon. 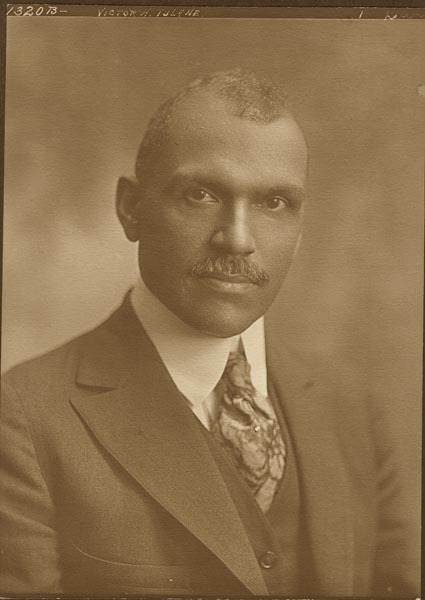 The 31 members who signed the petition were as follows: Henry W. Cleage, Mrs. Carrie Perkins, Mrs. Emma Moore, A. T. Roney, Mrs. Cora Donann, Mrs. Cathern Crenshaw, Mrs. Daisy L. Brabham, Albert Cleage, Mrs. Gertrude Cleage, James Myers, Mrs. A. L. McElrath, O. F. Dennis, Mrs. Hattie Mitchell, H. M. Mitchell, Mrs. Theresa Finley, Othello Finley, Miss Edith Finley, Miss Luell E. Hibbett, Mrs. Mary Peterson, Mrs. Anna Bowman, John T. Fox, Miss Pearl Reed, Thomas H. Bransford, Mrs. O. F. Dennis, Miss Alice Mathews, Miss Hilda Reeder, W. J. Perkins, Henry Moore and H. L. Hummons. For other fine Sepia Saturday photographs dealing with windows or lights or who knows click here. My family seems to have a habit of starting churches. To see a photograph of the congregation of a church started by the maternal branch of the family click Plymouth Congregational Church. George Reed was my grandmother Pearl Reed Cleage’s oldest brother. He gave his birth date as January 10, 1867, in Lebanon, Marion County, Kentucky. He never married and had no children but as the oldest in a home without a man, he became the man of the house. He never learned to read or write and earned his living as a laborer. We have no photographs of him. George is found in the 1870 through 1910 Census with his mother Anna Reed and various siblings. After Anna died and Pearl married I haven’t found him in any census but I did find him in the Indianapolis City Directory again in 1930. Turned out, George was not listed in the 1920 or the 1930 census due to the census taker stopping at the end of the 2800 block of Kenwood (both times). George does appear in the 1930 and 1940 Indianapolis City Directory at 2730 Kenwood Avenue. Pearl married in 1910 and mother Anna died in 1911, which means that George lived at 2730 Kenwood, alone, for over thirty years. Today the 2700 block of Kenwood is a parking lot. George is listed as 3 in the 1870 census and 13 in the 1880 census. This would make him born in 1867. George is listed as 28 in the 1900 which would make him born in 1872, same as on his death certificate. Clearly there is a five year discrepancy in his age as reported on various documents. According to my aunt, George migrated to Indianapolis as a young man of 15 to work at the Van Camp Canneries in 1887. 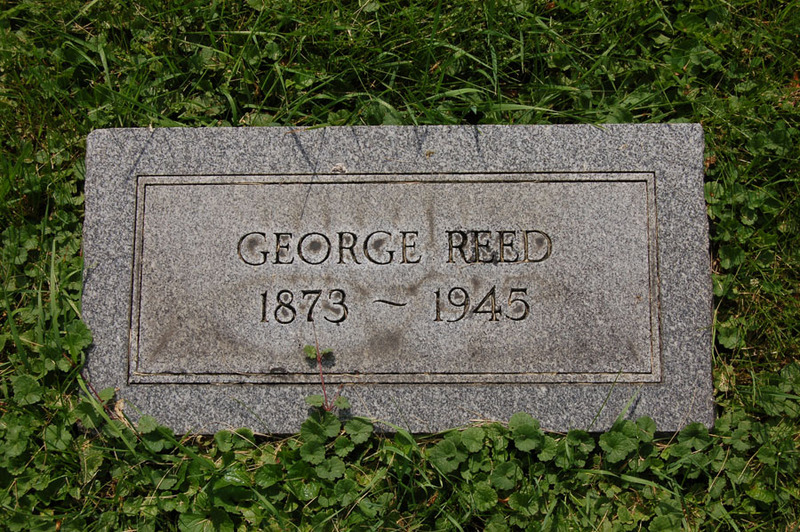 Since there are two colored George Reed’s in Indianapolis during the 1880s we need to be careful here. Our George is listed in 1891 at 11 Willard Ave. There is a George E in 1889 and a George in 1888 in the City Directory that also may have been him. 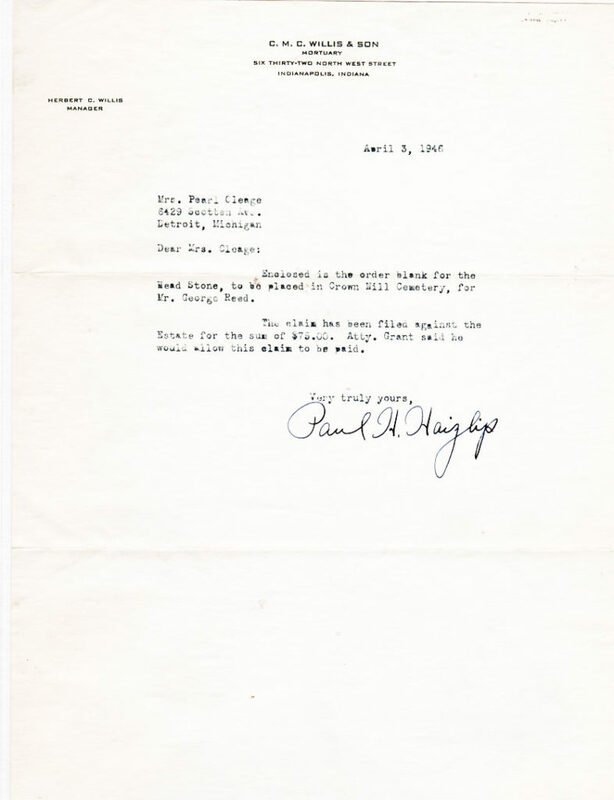 I believe that George did arrive in Indianapolis in 1887, however he would have been twenty years old and not fifteen at that time. During the next several years the whole family followed George to Indianapolis. My Aunt Anna told me that a friend of her parents called them from Indianapolis in 1945 to tell them that George had been found wandering around disorientated. My grandparents went and got him and he stayed with them in Detroit where he died later that year. He died on May 28, 1945. His body was sent back to Indianapolis by train and he was buried in Crown Hill Cemetery. There is a simple marble slab with his name and dates on it. I visited once. You can see it here. According to the Administrator’s Final Report there was $18,462.91 (Worth $243,814.95 in today’s dollars.) on deposit at the Railroad Men’s Building and Loan Association. He had a dividend on a savings account for $193.50 in 1945 and another $195.24 for 1946. Royalty from Rubber Stock came to $3.00, which brought his assets to $18,854.65. He also owned a single home at 2730 Kenwood, Ave. Included in the $1,025 costs for the administration of the Estate are $9.65 railroad fare to carry his remains back to Indianapolis and $75 to the Hoosier Monument Company. 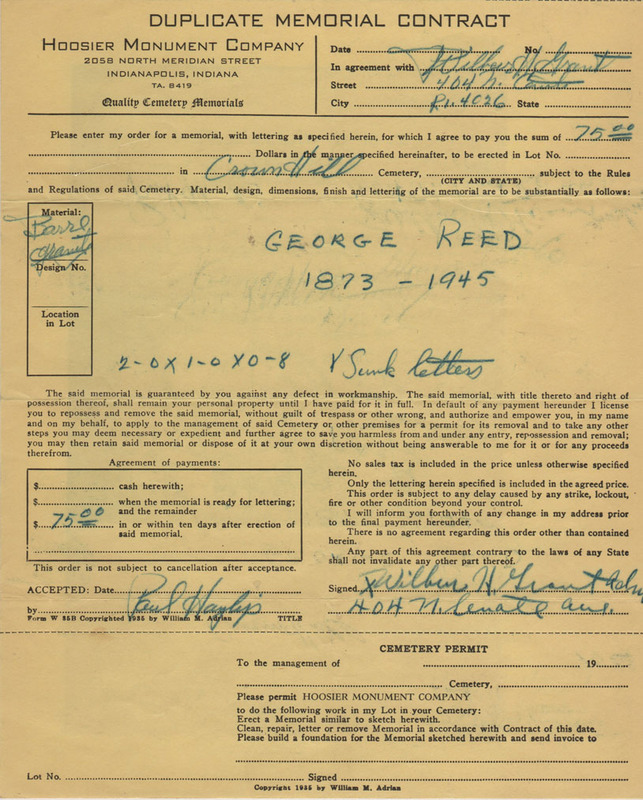 George Reed was my grandmother Pearl Reed Cleage’s oldest brother. Their mother, Annie Ray Allen Reed, was a single mother for most of her life and George was the man of the house. His resting place in Crown Hill Cemetery looks very peaceful. Thanks to Megan Heyl and her husband for taking this photograph. “As chairman of the colored division of the great “Man Power” celebration, which is to be held in Montgomery Wednesday afternoon, September 11, I desire to take this opportunity to urge all colored male citizens between the ages of 8 and 44 years, who are not already registered, to take advantage of the privilege of participating in this parade. “Our loyalty and patriotism as a race cannot be questioned. “We have gladly responded to every call that our country has made upon us during the present struggle for world democracy, and have also demonstrated our loyalty in every previous war in which our country has been engaged. “The purpose of this Man Power celebration is to arouse public enthusiasm and patriotism so that on registration day, Thursday, September 12, Montgomery and Montgomery county will be successful in having a 100 percent registration of all male citizens within the new draft limit. I was going to add some facts and figures about how many lynchings of black people took place in the US and Alabama during September of 1918 and that the men he was calling on to step forward and register could not vote or sit where they liked on the streetcars. Not to mention the large upswing in lynchings after WW1, especially of returning soldiers wearing their uniforms. Looking at the statistics and the pictures and thinking about it got too depressing. Did you know they sold postcards of actual lynchings? That one had slipped by me. So, I decided to just run the story and the photo of Victor Tulane and remind you of a few links to letters written in 1918 by young men who were called up or about to be, “Migration story part 2 – Letters from home – Montgomery to Detroit 1918” and “To be Where You can Breathe a Little Freedom”. And to stories of “Victor H. Tulane Dead” and “He Had Hidden Him Under The Floor“. 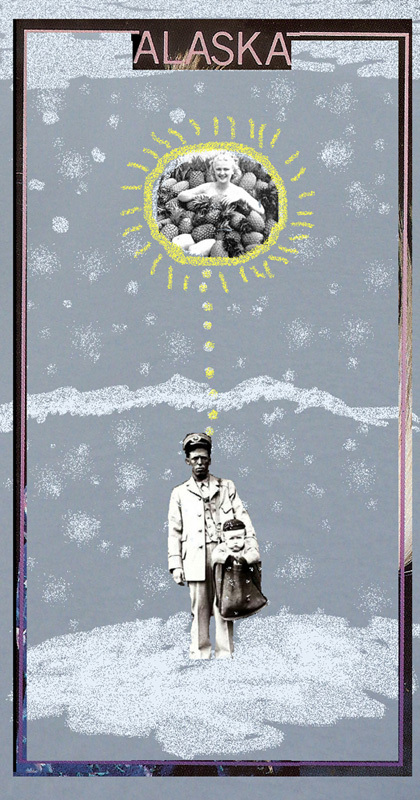 A Postman, some pineapples and Alaska. I can usually find a photograph to fit ever occasion in my collection. Someone doubted I could find a picture in my collection of a postman, a pineapple and Alaska. I put this together using cards in my postcard collection. I think it fits the bill. None of them are related I must admit. Here are my mother’s memories of her great Aunt Abbie, who lived with my grandparents until I was twenty. Aunt Abbie became very frail and was no longer mobile. My aging grandparents were unable to care for her and she was sent to a nursing home where she died several months later. Aunt Abbie married a Mississippi Riverboat gambler, swarthy and handsome and no good, who stayed home on two visits long enough to give her two sons and then sent her trunks of fine clothes to wear or to sell to take care of herself and the boys. Whenever she talked about him she sounded like she hated him. She resented the lack of money. Said once the oldest boy Earl (named for his father) screamed for days with toothache and she could not take him to the dentist, who didn’t want any fancy clothes or jewelry. She resented raising the children alone. I got the feeling she hated them and they hated her and she resented him being off having a good time while she stayed home with the problems. She talked about him in a completely different way than she talked about her Jewish policeman, who bought her a house on Ripley St. Spent much time there, for whom she loved to cook and keep house. She came to live with Mother to take care of Daddy(!) so Mother could come to Springfield and help me when Kris was born. In later years when they lived on Fairfield, Mother and Daddy used to argue about this and they would call me in to referee. He’d say he took Aunt Abbie in out of the goodness of his heart like all the rest of her family. And she was not supposed to stay on (!) them forever but was to go to live with Aunt Margaret. Mother would say Aunt Abbie came to take care of him because (here she would make a mouth at me) he could not take care of himself and work even though he could cook better than she and do everything else in the house too. (I think we are always angered at the way men can say this is the limit. I can’t or I won’t do this or that and we seem to have lives where you do what is to be done since you have no one who will hear you if you say you can’t or won’t. Hold my hand Charlie Brown!) And that he knew very well she was going to live with them and visit Margaret occasionally. Mother was right. He said Aunt Abbie came to have cataracts operated on and to be taken care of. He was wrong. Her eye operations came years later. He said to me once that he had always taken care of Mother’s people and she would have nothing to do with his. I know how Grandmother depended on him to fix things around their house. And he was most agreeable and I always thought he loved it. They made over him when he came with his box of tools. I was always there as helper, but he got very tired and mistreated about having both Alice and Aunt Abbie to take care of. He didn’t like either one. But I never could get him to send them to a nursing or residence home to live. He always said “What would people say if I did that?” When people talk like that I give up because they are obviously making the choice they prefer. Back to Aunt Abbie. She loved to cook and do everything else about the house. Mother would not let her do anything except clean her own room and do her own washing and ironing…..and Mother hated everything about housekeeping except cooking; but she said her husband expected her to take care of him and his house and (she didn’t say this,) she’d be damned it she’d let anyone else do it as long; as she could. I couldn’t talk to her about it.. Aunt Abbie tried to get her sons to let her come to NY and live with them. They wouldn’t even answer her letters. Sad. I have been looking for my great grandmother’s, Celia Rice Cleage Sherman, death record for years. I need to do a post just about that search but today I’m going to write about the death records and burial information I have found for most of the other Cleages I was looking for Here is my list for now. Louis Cleage – my great grandfather – Born about 1852 in McMinn County, TN. Died 7 February 1918 in Indianapolis, IN and was buried in Crown Hill Cemetery on 9 February 1918. The informant was his son, Jacob Cleage. 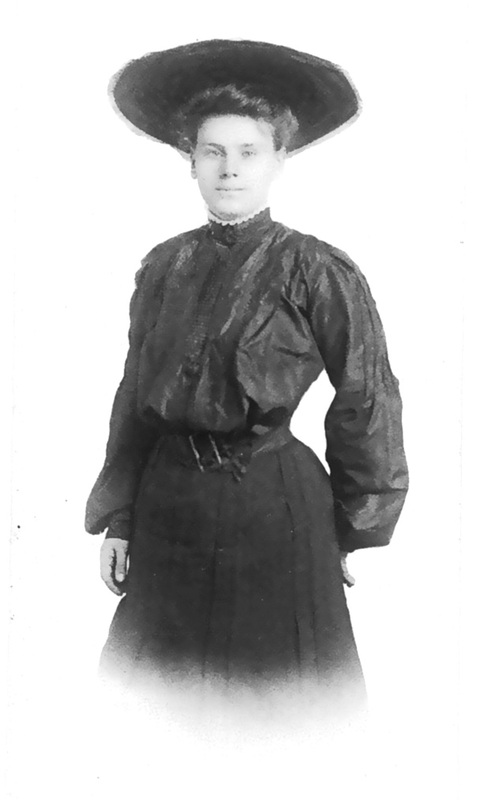 Josephine Cleage Cleage – born abt 1873 in Louden County, TN. 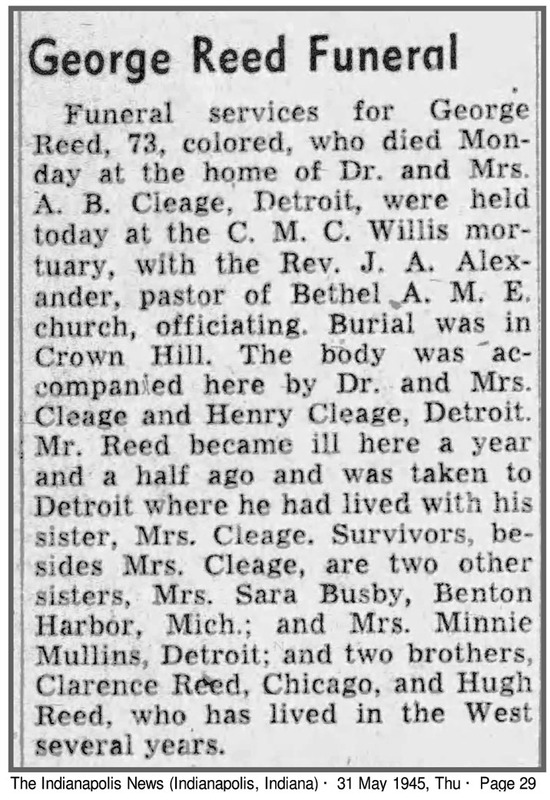 Died 1956 in Detroit and buried in Detroit Memorial Park Cemetery on 26 July 1956. The informant was Lucille Cleage Watkins, her daughter. Husband James Cleage – born abt 1870 in McMinn County, TN. Died early October in Indianapolis, IN. 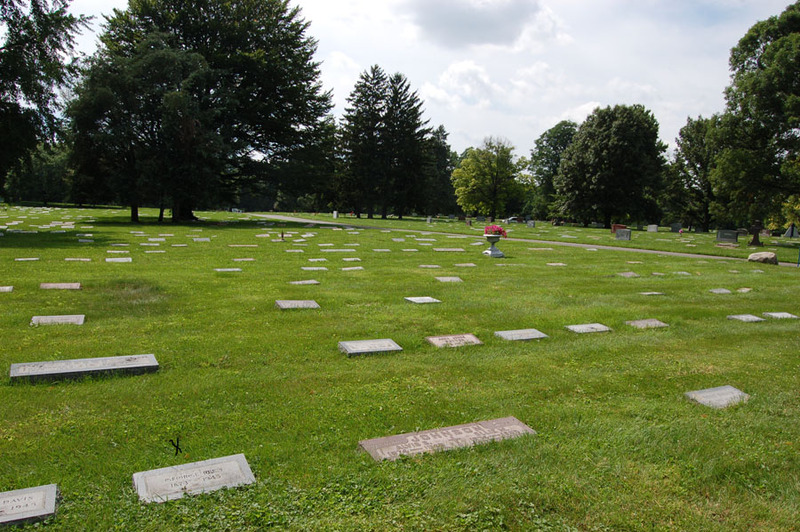 Burial date was October 12, 1933 in New Crown Cemetery in Indianapolis, IN. Information from New Crown Cemetery. Jacob Cleage – born abt 1875 in Louden County, TN. Died 7 December 1942 in Detroit and buried in Detroit Memorial Park Cemetery on 10 December 1942. The informant was Gertrude Cleage, his wife. 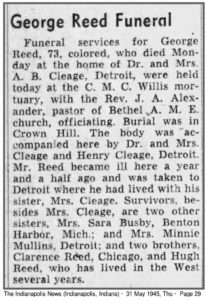 Wife Gertrude Cleage born NC and died in Detroit 28 June 1982 and buried in Detroit Memorial Park Cemetery 3 July 1982. Informant Richard Cleage, her nephew. Henry William Cleage – born 25 January 1877 in Louden County, TN. He died 4 October 1956 in Detroit and was buried in Detroit Memorial Park Cemetery on 10 October 1956. Informant was Willi A. Cleage, I think there is a typo, have no idea who Willi would be. First wife Minnie Loving Cleage, B. TN 1878 and died TN after 1901. Death date and burial place missing. Second wife Ola Mae Adams Cleage b. Danville, Kentucky 1888 and died in Detroit 3 July 1982. Buried in Detroit Memorial Park Cemetery. Charles Edward Cleage – born August 1879 in Louden, TN. He died 4 May 1926 in Athens, McMinn County, TN and was buried 7 May 1926 in Hammonds Cemetery, Athens TN. Wife Mattie Cordelia Dotson Cleage born 4 November 1886 McMinn County TN. Died November 1966, buried Hammonds Cemetery, Athens TN. Albert Buford Cleage Sr.(my grandfather) – born 15 May 1883 in Louden, TN. He died in Detroit 4 April, 1957 and was buried in Detroit Memorial Park Cemetery on 15 April 1957. The informant was Pearl Cleage, his wife. Wife Pearl Doris Reed Cleage – born 1886 Lebanon, KY. Died 16 July 1982 in Idlewild, MI. Buried 22 July 1982 Detroit Memorial Park Cemetery. Informant Henry Wadsworth Cleage, her son. 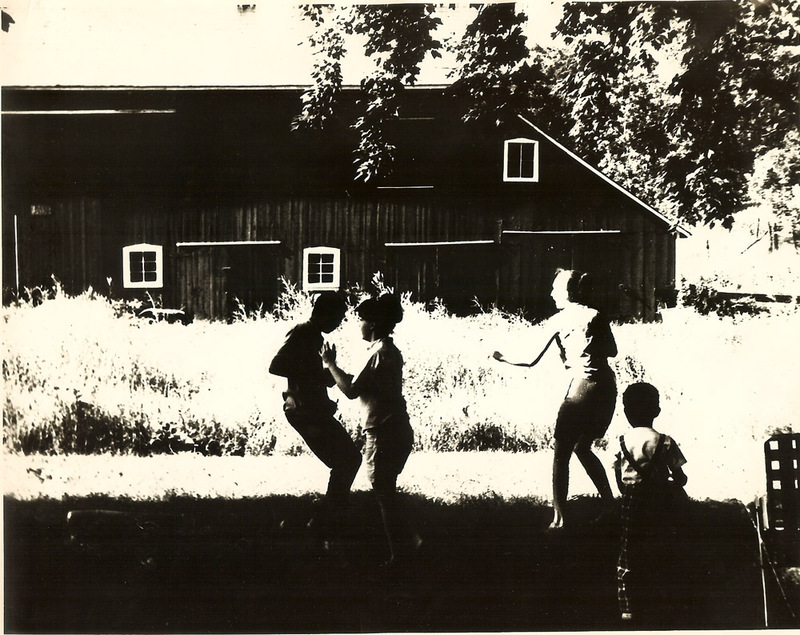 This photo was taken by my uncle Henry in 1962 at an old house we had in the country. It was between Wixom and Milford Michigan and about 40 minutes or less from Detroit. We had the old farm house and two acres, not including the impressive barn in the background. Maybe we were playing a trucated version of baseball. My cousin Warren seems to be coming in to touch base? I seem to be hysterical. Was small Blair in the game? My Sepia Saturday tie in this week is not through the designated photo but through a fellow Sepia Saturday contributor who I got into a discussion with about racism in the USA today and in the past and somehow it came up that I have Canadian cousins and that one of them played football for the Eskimos until a recent achilles tendon injury. TickleBear turned out to be a big football fan and when I mentioned my cousin and said he was now playing for the BC Lions and that his name was Kamau Peterson, he (Ticklebear) was quite thrilled. I must admit that I’m not a sports fan of any kind and although I’ve kept up with my cousin’s growing family I have not really paid much attention to his football career. I had to go check his fb page and go to links to catch up. I knew he was doing well at it because that’s what we do, do well 😉 But I didn’t know the details. Here is a photo of my well known Canadian Football playing cousin, Kamau Peterson. He also has an awesome full back tattoo which you can see in progress here. You can see other Sepia Saturday offerings here. 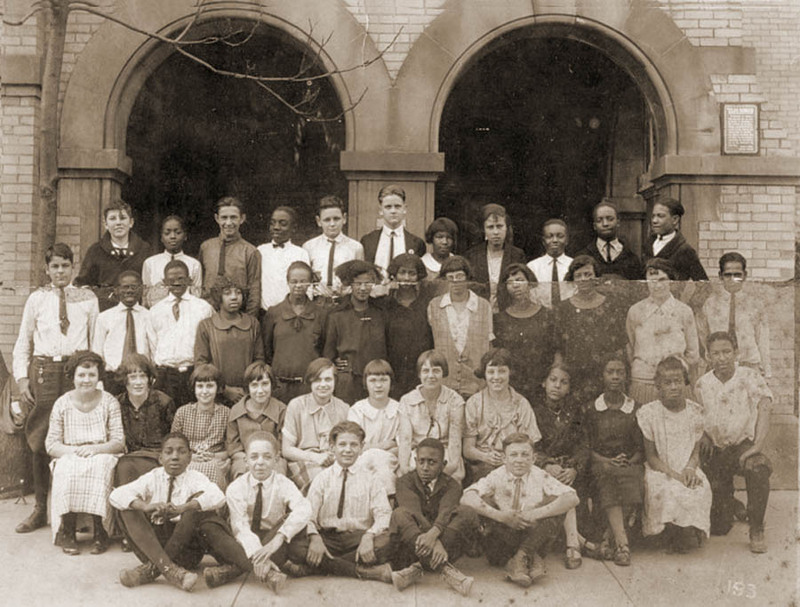 My father, Albert B. Cleage, Jr (front row, second from left), with his 8th grade class at Wingert Elementary School in Detroit, Michigan. He was 12 years old. It was 1923.